We are the called, gathered and enlightened people of God. We seek to express our faith by gathering to worship and grow in our faith through the study of God's word and sharing in the sacraments. We respond to Christ's love by serving in our community and the whole world. The statement of the mission of Trinity Evangelical Lutheran Church, Bryan, Ohio is - Guided by the Holy Spirit, Trinity Shows & Tells God's Love in Word & Deed with ALL! We trace our roots back to 1864. 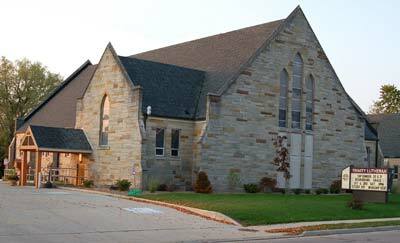 Trinity Lutheran has been in existence since 1947 when St. Paul Lutheran of Bryan and Immanuel Lutheran of Ney merged to form a new congregation. Our first building on Center Street (now our Parish Hall) was dedicated in 1949. Our present worship center was dedicated in 1969. Midweek Lenten, Holy Week, and Christmas Eve Services are publicized in the Trumpet Newsletter. Music is a big part of our life here at Trinity. 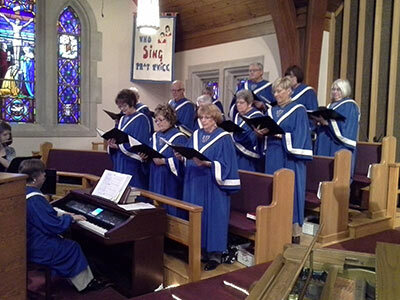 Adults and children are encouraged to participate in one of our choirs. The Children's Chime Choir is open to all 1st - 5th graders...if interested please contact Lynnette Diaz. General practice times - see the monthly Trumpet newsletter for details or changes. The Nursery is unsupervised and unstaffed. Children are always welcome in worship, however. The occasion may arise in which a nursery space provides the best option to utilize to respect fellow worshippers, as well as provide a respite for a fussy child and parents. If that is the case, please feel free to use the nursery space downstairs. Mission Partners Program - Salem Lutheran in Toledo, Ohio. Trinity provides a meeting place for many community organizations such as AA, Girl Scouts, Boy Scouts, Brownies, team football dinners, and more.